Real Madrid and Sevilla go head-to-head in the UEFA Super Cup in Trondheim (norway) on Tuesday night. Who will lift the first European trophy this season? This article contains our Real Madrid v Sevilla betting preview with free predictions, betting tips, probable lineups, team news, enhanced odds, bookie offerse and exclusive no deposit free bets! Real Madrid started their International Champions Cup quest with a disappointing 3-1 loss to Paris Saint-Germain. Then the current Champions League holders recorded back to back wins over Chelsea and Bayern Munich in the same competition. With only 3 games played so far, the Blancos will not be at full strength. Anyway, one silver lining of Real's pre-season has been the sensational form of youngster Marco Asensio. Cristiano Ronaldo is still out after having picked up that leg injury in the Euro 2016 Final victory over France. His fellow countryman Pepe will miss the match along with Gareth Bale and Toni Kroos after all their extra summer exertions in the Euro 2016. Alvaro Morata is likely to spearhead the attack, with James Rodriguez and Isco on his flanks. The likes of Casemiro, Modric and Kovacic are expected to start in midfield while Jese Rodriguez has moved to PSG earlier this week. Dani Carvajal should be preferred to Danilo at right-back. Sevilla have problems of their own too, having lost manager Unai Emery and key men Grzegorz Krychowiak, Kevin Gameiro and Ever Banega during the summer. Anyway, they should be high on confidence after winning five friendlies in a row in the lead up to this clash, backed up by the new ideas and intensity of coach Jorge Sampaoli. Luciano Vietto should get the nod to start up front after joining from Atletico Madrid. New signing Franco Vazquez is expected to start, though Ganso is also in contention. Konoplyanka and Vitolo are likely to be the starting offensive wingers while Kranevitter and N'Zonzi will start in the middle of the park. Real won the last time these two sides faced together in the Super Cup back in 2014. The last seven encounters between Real and Sevilla have produced Over 2.5 Goals and both teams found the back of the net in six of those meetings. REAL MADRID (4-3-3): Casilla – Marcelo, Ramos, Varane, Carvajal – Casemiro, Modric, Kovacic – Isco, Rodriguez, Morata. SEVILLA (4-2-3-1): Soria – Escudero, Mariano, Rami, Pareja – N'Zonzi, Kranevitter – Konoplyanka, Franco Vazquez, Vitolo - Vietto. 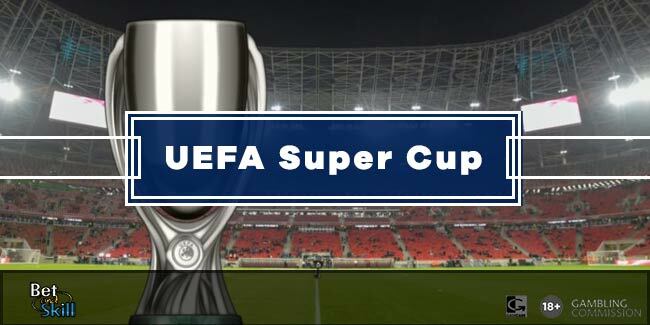 "Real Madrid v Sevilla predictions, betting tips, lineups and free bets (UEFA Super Cup - 9.8.2016)"